Upsets followed by more upsets, from the very first round in the Men’s Singles event there had been performances to raise the eyebrows, surprises; none more so than in the contest that started proceedings when Japan’s Yukiya Uda beat Portugal’s Tiago Apolonia. It set the trend. However, as they say all good things must come to an end, on the late morning of Saturday 4th November the adventures of Yukiya Uda were halted. The 16 year old was beaten by his 18 year old colleague, Masaki Takami; he received a taste of his own medicine. In the opening round he had beaten Tiago Apolonia in six games (11-9, 12-14, 6-11, 11-5, 11-6, 11-9), in the penultimate round he experienced defeat in five games reverse (8-11, 11-9, 12-10, 11-9, 11-7). A contest between two players, very evenly matched, each had started their journey in the qualification tournament some four days earlier; whatever the outcome both had excelled expectations. Ask either player one week ago if a semi-final finish would be a satisfactory outcome and I suspect the answer would have been in the united affirmative. Undoubtedly, the outcome was difficult to predict but if you wish to be somewhat pedantic, the result did follow the pattern of upsets. In the recently published Men’s World Ranking list for November, Yukiya Uda is listed at no.220, Masaki Takami stands at no.243. An upset, the second semi-final was a clear upset in terms of status but again I would suggest it was a contest between players of a very similar level; Korea’s Kim Donghyun, the no.8 seed, accounted for Germany’s Ricardo Walther, the no.2 seed (11-7, 11-6, 11-8, 11-8). 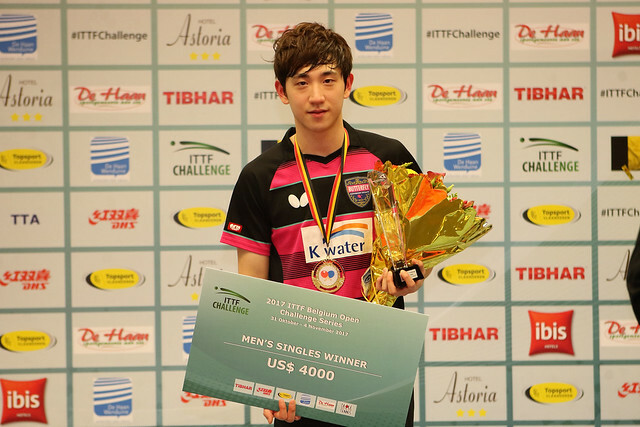 Defeat for Ricardo Walther and the end of any hopes the 25 year old may have harboured of repeating the success gained three years ago when he won the Men’s Singles title at the GAC Group 2014 ITTF World Tour Croatian Open in Zagreb; in De Haan it was semi-final sadness.